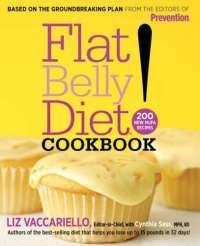 Flat Belly Diet is a New York Times bestseller by Liz Vaccariello. This book outlines an eating plan based on adding monounsaturated fatty acids or MUFAs into your meals to help rid you of belly fat. The book begins with a four day eating plan which basically rids you of bloat. Then you eat four weeks of meals that include lots of MUFAs to continue ridding your body of belly fat. I must say, the science behind this diet intrigues me. I received the Flat Belly Diet Pocket Guide, which is a pocket sized version of the book, to review. As i said above, I find the science behind the diet intriguing. The book is full of interesting information. Liz Vaccariello writes in a very easy to understand way and she explains everything very clearly. This was a big plus for me, as I've read diet books that left me wondering what in the world the other had been trying to tell me. That is not a problem here. The author is very knowledgeable on the subject and that comes through in her writing. I was also sent the Flat Belly Diet Cookbook, which I am absolutely in love with. It contains over 200 mouth watering recipes, many of which can be prepared in less than half an hour. When you flip through this cookbook, the idea that it is diet related is the furthest thing from your mind. I especially like that these are recipes I could feed to my family and they would eat. So called diet food is rarely a hit around here, but this cookbook is changing that. In my opinion, the diet book and cookbook are both full of good information. This eating plan would be the perfect thing to start at New Year's to get your resolutions off to a great start. The recipes are delicious and do not feature exotic ingredients, you can find everything at your local grocery store. So, if you need to lose some fat, you might want to check them out. I suggest clicking over to www.prevention.com/flatbellydiet for more information. And just in case you don't believe me about the recipes being yummy and family friendly, check out this recipe for Peanut Butter-Stuffed French Toast. 1. Preheat the over to 350°F. Coat in baking sheet with butter-flavored cooking spray. 2. Place the syrup in a medium glass bowl and microwave on high for 30 seconds or until simmering. Add the strawberries and set aside. 3. Spread 2 tablespoons of the peanut butter on each of 4 bread slices and cover with the remaining 4 slices, making sandwiches. 4. Beat the eggs, milk and vanilla extract in a 13” X 9” baking dish. Soak the sandwiches in the egg mixture, turning once. Place on the prepared baking sheet. 5. Bake for 25 minutes or until browned, turning once. Top with the reserved strawberry mixture. Ramblings of a Texas Housewife Product Review and/or Giveaway Disclosure- I have received no compensation from Prevention other than the offer of free product to review and/or giveaway. Any opinions expressed on Ramblings of a Texas Housewife are my own. My reviews are never reviewed or edited in any way by sponsors. I took have looked at this cookbook. Thanks for the review on it. I've heard a lot about the flat belly diet and thought about trying it since I have some post-baby muffin top I need to get rid of. I heard about the flat belly diet before. I really got to get my hands on this! It had really peeked my interest.